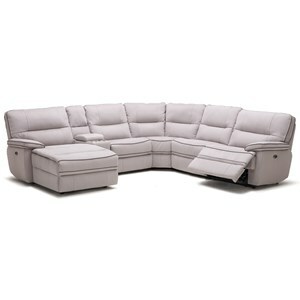 Create the ultimate relaxation and hosting spot when you bring home this contemporary style power reclining sectional. 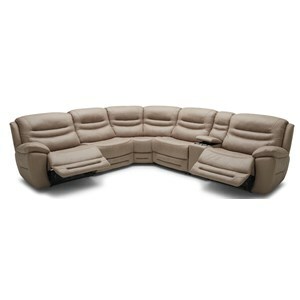 The sectional features a pair of reclining seats as well as a chaise so you and your friends and family can relax while the two tone upholstery pairs with the crisp silhouette to create a modern look perfect for your living room, family room, or man cave. 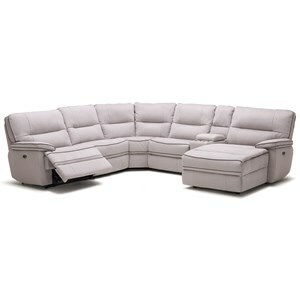 The Laertes Contemporary Power Reclining Sectional with Chaise by Homelegance at Beck's Furniture in the Sacramento, Rancho Cordova, Roseville, California area. Product availability may vary. Contact us for the most current availability on this product. 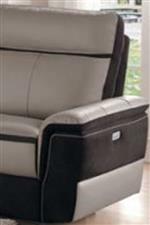 8318-AC Armless Chair 2 30.5" 36.75" 39.5"
8318-CR Corner Seat 1 56" 42" 39.5"
8318-RRPW Power Right Side Reclining Chair 1 39.5" 36.75" 39.5"
8318-CN Console 1 13.75" 30.25" 39.5"
8318-5L LSF Chaise 1 39.5" 62" 39.5"
Fabric Content Top grain leather featured everywhere your body touches the sectional except for footrest which features a fabric. Arm Top of arm is top grain leather while side features fabric panel. Create the ultimate gathering space when you bring home a piece from this collection. Each piece in this collection shows off a power recline mechanism that ensures you can find a comfortable spot to relax in. Each piece in the collection also shows off a contemporary look thanks to two tone upholstery built upon further by crisp silhouettes to create the perfect look for your modern living room, family room, or man cave. The Laertes collection is a great option if you are looking for Contemporary furniture in the Sacramento, Rancho Cordova, Roseville, California area. Browse other items in the Laertes collection from Beck's Furniture in the Sacramento, Rancho Cordova, Roseville, California area.